Naved was caught after being overpowered by two men he had taken hostage. “Take me out of the area, I will return to Pakistan,” he told his captors. 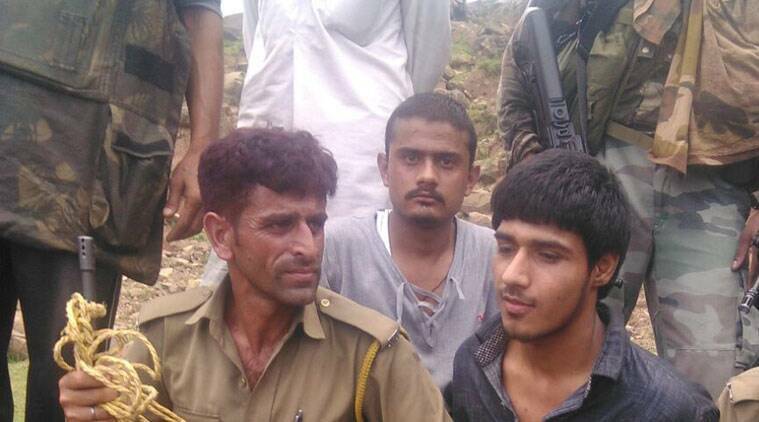 One of the terrorists (right) captured alive. Soon after he was nabbed, Mohammed Naved alias Qasim Khan said, “It’s fun doing this… I came to kill Hindus”. “I am from Pakistan, my partner was killed in the firing but I escaped. Had I been killed, it would have been Allah’s will. There is fun in doing this,” Naved was quoted as saying. Wearing a dark blue shirt and brown trousers, Naved alleged that he was here because Kashmiris were being killed. “It has been 12 days since I came here. We walked for days in the jungle,” he said. But he later told police that he and three others had crossed the Line of Control 12 days before Ramzan — in the first week of June. “He only wanted us to take him out of the area, so that he could return to Pakistan,” said Shamsher Singh, a panch of Chirdi village. “He told us that they entered the state after crossing the Line of Control in Poonch. He said they had been moving around in Jammu region for the last 12 days,” he said.